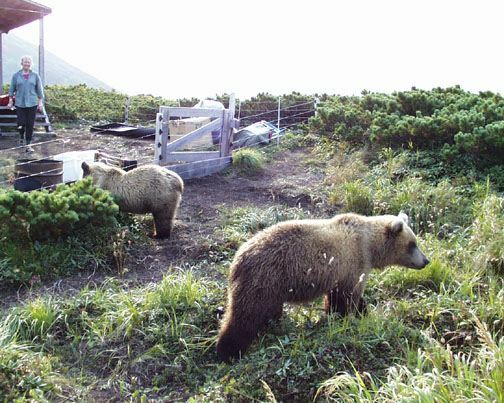 As Maureen wrote in the last entry, we had to acknowledge, once again, that there was a real world outside of the one that we have created for ourselves here with the bears of southern Kamchatka, and that we had better make a move to get out of here now or be stuck in our cabin for the winter. 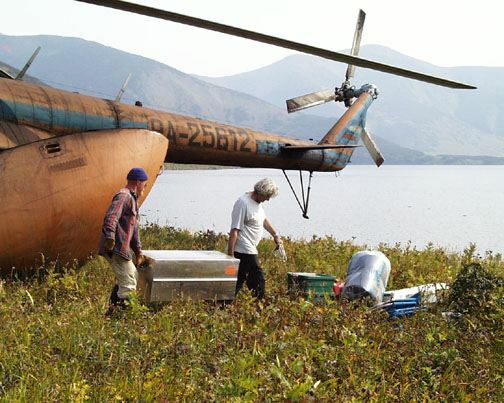 It was a big job to pack up as we have to take everything out of the cabin and fly it all to the research station at Kurilskoye Lake for security reasons. This even includes things like our oil burning stove, as it would be coveted by anyone that might land in a helicopter and who is faced with a cold winter at home. Under the tough circumstances I would do the same. Also we packed out extra barrels of airplane gas, tools, left over food, and a thousand other things that it takes to live and fly an airplane in the wilderness for five months of the year. We left the electric fence around the cabin and the outhouse as the bears in the area respect it even though there is no power to shock them. In previous years we have gotten away with this but even if a bear did get through it, the cabin is secure with metal shutters on doors and windows. A couple of hours before the helicopter arrived the cubs came to see us. We had only seen them once briefly, across the lake in the past 7 days, so we took a half a hour to go with them along the lakeshore and to say our good-byes. They are in wonderful condition, and suddenly much bigger from all the salmon berries and pine nuts that they are eating and it is still two months until they will hibernate for the following six months. We feel confident that they will make out beautifully on their own now. Never the less it was sad to have to leave them and this place in the uncertainty of the Russian situation. We were both exhausted buy the time we got the helicopter loaded and the day was still only half done. I followed it to the station in my plane to help unload and say goodbye to our friends and headed into a wall of dense smoke that has been blanketing much of Kamchatka whenever the winds bring it here from the many forest fires still burning on the far side of the Sea of Okhotsk. It is a 150 miles that I am getting to know quite well but with the visibility only about two miles in premature darkness, I had to pay attention to my compass carefully. However, the air was as smooth as silk and I couldn't resist stopping at my two favorite places to have short walks in each as I have grown to love this peninsula a great deal after four years of adventures here. Twenty miles out of Petropavlovsk there is a road that climbs high into the alpine country on the way to a thermal electric power station on a volcano. There were many berry pickers camping in the beautifully fall colored tundra along this high road and as I cruised by them, the children especially, enjoyed the unexpected appearance of such a strange flyer as it is not a common sight in Kamchatka. For my part, it was so pleasant to see how many people enjoy the experience of taking from their beautiful, resource rich country in times when every mouthful that they can harvest is meaningful. Landing at the flying school where I keep my plane for the winter was another treat as it too was a bee hive of activity even though it was late Sunday evening. There were two other home built aircraft in the air and several others on the ground along with various other airplanes and my sudden unexpected appearance was greeted with enthusiasm and warmth as my ability to survive year after year in the wilderness with a plane that I built myself gives them energy and inspiration to fly their own creations but they go a big step further by also designing their planes themselves. There is however a Kolb Mark III there, just like mine, that we brought as a donation towards our working in the sanctuary for the duration of our project. They built it from a kit two years ago and it is now being used as a training airplane at the school and everyone loves to fly it. What was remarkable was that every where I looked people were having fun while there was so much uncertainty in their country that could mean hard times ahead. Their spirit seems undeniable. Within minutes of my landing, a friend arrived to pick me up and take me into the city, even though I had told no one my actual plans of arrival. Just another example of how we are looked after by our friends here and why we have some difficulty to leave them in their troubled land even though, in other ways we have a lot to look forward to by getting home. It was thankfully a day free of fog on the Sunday morning of our departure. What Charlie did not mention was that we spent a hectic 2 days lifting the many boxes of our camp supplies to our self -made helicopter pad by the lake for loading. 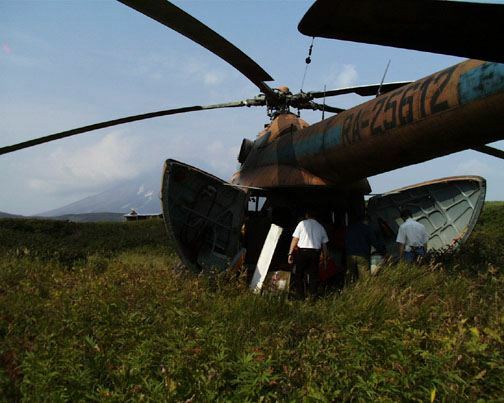 I felt especially tense this year waiting for the helicopter to take us back to Petropavlovsk for two reasons: One, the last two pick-ups by helicopter were aborted for many days due to fog and wind. Second, it was a friend who was going to use their helicopter, which is usually used for flying the many Kamchatka rivers for fish counts, that was to pick us up. But at 3:00PM we were loaded. As the helicopter lifted off, I saw Charlie nailing shut the cabin before going to his plane. My trip in the helicopter was equally interesting and beautiful. 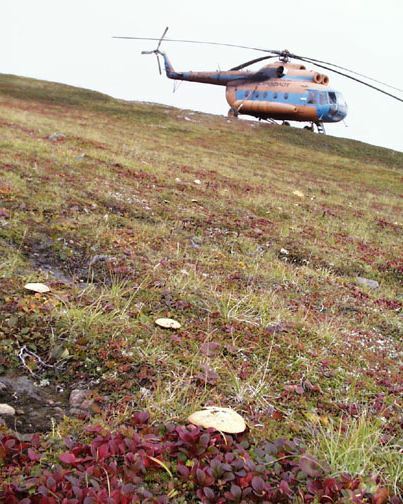 The chopper stopped on a mountain ridge so the pilots and Alexi Maslov, our friend, could pick mushrooms. We landed an hour later along the coast to pick up the wives of the pilots, who had been picking berries on the tundra all day. The last stop was pure heaven - they landed at a hot spring and I had my first hot bath in 4 months!! All summer I swam in the cold lake or used our solar shower which has a limited supply of hot water. There was a lot of smoke haze in the air as we flew into Petropavlovsk in the late evening. Although people are facing a very tough winter here with the economy in such terrible condition, people are still jolly, living one day at a time, leaving thoughts of a cold winter for when it arrives. Tatiana Gordienko, our Russian partner in our project from the Committee for Conservation, and her husband will go to the tundra to hunt for a month. With the prospect of no fuel for heating their apartment this winter, they are planning to make a wood heater with the chimney to go out the window, I think!! The bank that had our money is closed, but our official interpreter, Olga, along with a letter from Tatiana's Committee, convinced the armed guard to let us in the bank to meet the manager. He decided to give us our US$ cash which we had left there. People are trying to exchange any rubles they have into US$ and the banks have a limited supply. They open only an hour a day and we were lucky to get our funds. Shops are empty. No one has money. Alaska Air will stop all flights into the Russian Far East in 2 weeks, so we came out just in time. Charlie and I return to Canada on September 17th. I felt very sad to say goodbye to our cubs and Kambalnoe Lake. I dread becoming reacquainted with many aspects of our consumer life style in America, but I can hardly wait to sit in our hot tub and eat some good Alberta beef. I am so sick of canned meat!!! I long to clean my fingernails and wear some fancy clothes. Life in the wilderness is very special, but I am ready for a break.